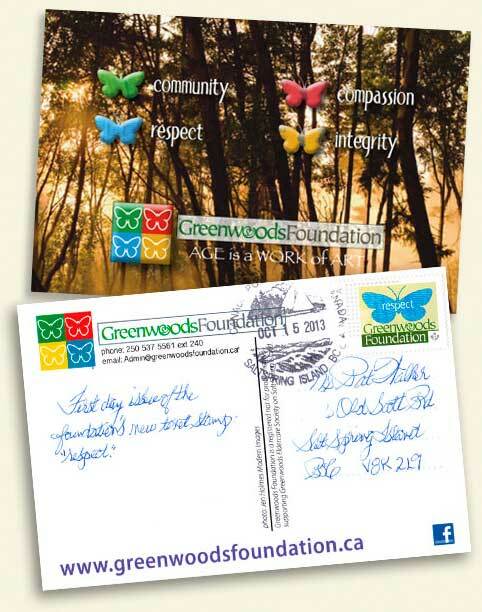 To mark the first day issue of our new Greenwoods Foundation stamp on October 15, 2013, postcards were mailed with the stamp which features the second of the Greenwoods Foundation’s four tenets: “Respect”. The front of this postcard features a photo by Jen Holmes Modern Images overlaid with our Foundation four tenets, words we live by. This legitimate postage stamp with a value of “Standard Lettermail”, $0.63, is produced in conjunction with Canada Post and is available through special order. Our first tenet stamp, “Compassion”, was issued on May 1st of this year. The postcard for this mailing was cancelled in Ganges with the unique Canada Post Salt Spring Island franking.